WallFry (my nursery art store on Etsy) is really taking off and due to popular demand, I am now selling my paintings on canvas as prints! 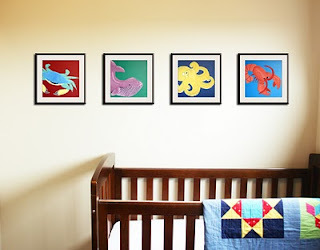 I love painting, and one of the best things about purchasing hand-painted nursery art made-to-order is that you can customize colors and designs. This is one of the 'points of difference' that has made WallFry so successful so far. So, I will still be selling my paintings on canvas and still taking custom orders made-to-order in addition to selling the prints. I was so excited to see my art as a print for the first time, the quality and detail is amazing! I am really hoping that this will make WallFry artwork more accessible to more people (and so much cheaper and easy to ship too). 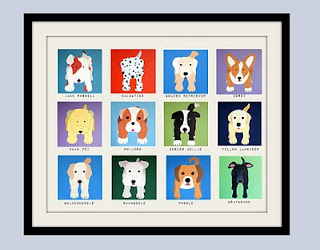 So far I have printed the Safari Series, the Sea Creature Series and the 12 dogs in one (above). 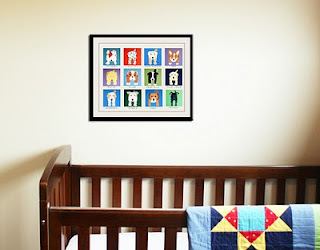 I am working on digitising my dinosaurs so that customers can customize colors to match their nursery color schemes.